Is Adam West's final outing as Batman a worthy one? It definitely is. It is typical for his character, that he first portrayed over 50 years ago. It is fun, perfectly goofy, but without turning into a total nonsensical mess. There still is a story, there still are real characters, but it never forgets that it is mostly here to entertain you and give you a simple- but good time. I definitely prefer the more entertaining Batman over any of the moody and more serious shots at the character, especially when it comes down to the animated movies. 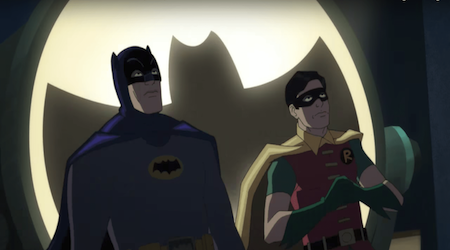 This movie definitely is in the vein of the '60's "Batman" series, starring Adam West and Burt Ward, among others, who reprise their roles of the dynamic duo once again for this animated movie, alongside series regular Julie Newmar as Catwoman. The story is perfectly random, featuring all sort of Batman regulars and classic characters, while still following a clear main plot line as well. Sure, because it is all so random and often goofy it doesn't work out as the most convincing or effective movie, but it is one of the things that helps to make this movie such a perfectly 'light' and fun one to watch. I still have to say that it is true though that I wish that the movie would be a bit more focused at times. It for instance is pretty crazy how this movie features all sorts of Batman villains in it, without any of them making much of an impact or serving much of a purpose at all. Thing that I definitely like better about the movie is how perfectly old fashioned it feels. The story, the look, the pacing, it is all very reminiscent of an '60's production, though at the same time it lets the movie feel like basically nothing more but an extended '60's series episode (though it is only barely 72 minutes short). There isn't quite enough 'boom' and 'punch' to this movie to elevate it. Story-wise, action-wise and animation-wise it is all pretty average. Good, but nevertheless average. No spectacular set pieces, no real memorable action. I just don't think that I am going to remember much about this movie in two weeks from now, despite really enjoying it. It also seems that the actors had some real fun with this movie and there characters. Besides Adam West and Burt Ward, William Shatner also plays a pretty big part in the movie as Harvey Dent/Two-Face. It works. There are some good dynamics between all of the different characters, which is also really due to the voice acting. Also really one of the reasons why I consider this animated movie to be a worthy last one for Adam West, who died in June of 2017. The movie is also good and pretty to look at, with its exaggerated comic book style, without taking things too far. Like I said before, I definitely like this more 'cheerful', colorful and entertaining Batman movies better than the more dark in tone and serious ones. The animation's are all good and the characters definitely look like the actors portraying them as well, which is fun to see.